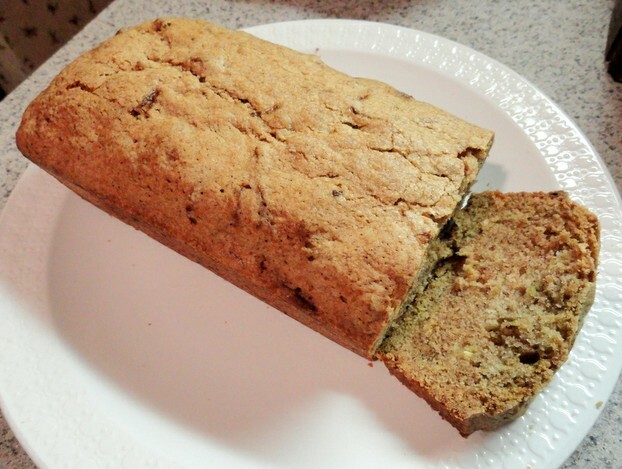 One of my favorite bread recipes I look forward to making in the Fall is Zucchini Bread. My mom use to make this all the time but since she isn’t about to now I carry on the tradition of making it. I do, however, leave out one ingredient which is the nuts that she always put in it. I’m not too fond of nuts in my baked goods. This recipe calls for vegetable oil but since I didn’t have in my cupboard I decided to try olive oil. It turned out really good in spite of the different oil; even the coloring of the bread seemed softer instead of darker. The taste was good but needed a little more cinnamon to set off the difference of the olive oil in the zucchini bread but other than that it was delicious! In medium mixing bowl beat eggs. And vanilla, oil, shredded zucchini and vanilla. Mix well. Then in another bowl mix flour, salt, soda, cinnamon, baking powder and nuts together. Add to Zucchini mixture. Mix well. Pour into 2 greased loaf pans. Bake at 350 for 45 minutes to and 1 hour. Insert a toothpick in center of cake when take out of oven to make sure that it comes out clean and is done. Cool on a wire rack. Remove from pans. Rinse the zucchini off. Then peel the skin off to get it ready to shred. Use a shredder to shred 2 cups of zucchini. Break 3 eggs into a bowl, beat them up. Add 2 tsp vanilla to the beaten eggs. Add 1 cup of oil. Normally I used vegetable oil but used olive oil this time around. Add 2 cups of zucchini. Mix thoroughly. Add 2 cups sugar. Mix all together. Mix well! Set aside while you mix the dry ingredients. In a separate bowl from the zucchini mix add 3 cups of flour. Add 1 tsp salt, 1 tsp soda, 3 tsp cinnamon, 1/2 tsp baking powder. Mix all dry ingredients together. Add zucchini mixture to flour mixture. Mix well! Divide batter into two bread loaf pans. Pop into the warmed oven of 350 degrees for 45 minutes. Olive Oil is really rather healthy for you. Probably more so than just your plain vegetable oil. Here are some facts I found about olive oil. It is believed to have a protective effect on certain cancers such as breast and prostrate cancer. The more fresher the oil; the better the taste. It has a higher portion of mono-unsaturated fats than animal fats. You can lower your risk of coronary heart disease by using olive oil. It can reduce the bad cholesterol which the LDL and increase the good cholesterol which is the HDL. So you see by using Extra Virgin Olive Oil in this batch of Zucchini Bread was healthier than I realized. I’d never used it before in my baking but I’ll be more inclined to now especially with all the healthy facts about it. Healthier is always the better choice! Thanks for this recipe, Cheryl, which comes at the right time for me, as I have a glut of courgettes/zucchinis from the garden and was looking for a sweet, rather than savoury, dish to use them in.